Deus Ex’s RPG systems were generally well implemented yet exceptions to the rule apply, of course pointing to the obvious lack of value of the Swimming and Environmental Training skill in comparison to other skill counterparts. However other examples also exist such as the demolitions skill. The focus of GMDX in regarding RPG systems is to add balancing, depth and include integration of new game mechanics (e.g mantling). This page will only cover the Skills and Perks systems. 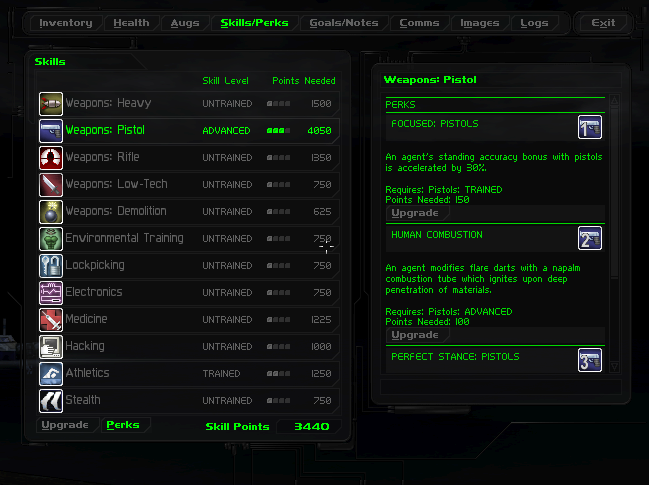 For Augmentations or anything else RPG-related, see the respective feature pages. GMDX features extensively rebalanced skills to increase build viability. Everything behaves as it it did originally, except with many additions and tweaks to improve balancing and depth. Swimming is superficially replaced with ‘Athletics’ which is tied to the new stamina system, in addition to the default intention of improving swim capability. The new Stealth skill helps the player manage the upgraded AI and adds convenient and enjoyable stealth functionality, such as faster leaning. Environmental Training is tied to a fully-fledged armor system, which enables the player to use and reuse wearable equipment, which has seen a considerable overhaul. Demolitions increases grenade blast radius, again in addition to what the skill did originally, and so on. Additionally, minor level design changes also exist to add weight to specific skills that were underutilised in the original game. For example, a new path may be available to take that is irradiated, which ties into the Environmental Training skill via the Hazmat object (plus the Environmental Resistance augmentation). Perks are branching trees from the skills system, and are essentially an extension of the system, adding further non-linearity to skill choices. For example, if you upgrade demolitions skill to ADVANCED, this enables you to optionally spend some skill points to purchase the respective ADVANCED level perk, should you choose to. In this case, it will be the SHORT FUSE perk, which decreases detonation time of grenades by 1 second. Other examples include increasing the wireless range of multitools with WIRELESS STRENGTH. The TOXICOLOGIST perk which removes poisonous toxins from the bloodstream when the player applies a medkit to the torso, and the PIERCING perk which causes organic targets to flinch more frequently when attacked with melee weapons. Perks serve many purposes and roles, and game design notes may be included here in the future detailing the intention and intricacies behind them, so check back at a later date if you’re interested.